What does it mean to say “all for Mary,” and how does it work as a description of the spiritual life? 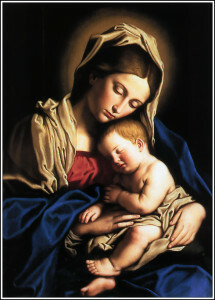 First, it means “all for the true doctrine of the Incarnation.” As we have said before, the early Church judged that there was no clearer statement of Christology than calling Mary “Mother of God.” The key challenges to a right understanding of Jesus are Arianism (that Jesus is less than God), Monophysitism or Docetism (that Jesus is not really human) and Nestorianism (that the God-part of Jesus and the man-part are kind of two different persons). To focus on Mary is, above all, to recognize that we easily lose track of who Jesus really is. If we are not careful, we slip into mistaken ideas of Jesus. To focus on Mary is to be careful about our Christology – to realize that we are constantly tempted to say, “Mary can’t really be Mother of God. That doesn’t make any sense.” To be zealously “all for Mary” is to be zealous about the truth of who and what Jesus really is. Ironically, there is no other way to be truly Christ-centered than to keep Mary central in our thinking and devotional life. Second, “all for Mary” means being zealous for the truth of the Redemption. Again, falsehood is so very easy. Protestants tend to fall into a denial that Jesus does anything at all for us. The pleasant way to put the standard Protestant understanding is that Jesus saves us by covering our sins. But a truer way to put it is that in most Protestant understandings, the “good news” is that Jesus does not really care who we are, does not care whether we love God, does not care whether we love neighbor. “Forgiveness” turns into “Lucky us, Jesus doesn’t care.” This is really dangerous. But equally – perhaps more – dangerous is that Catholics tend to fall into Pelagianism. I believe (above all from my experience teaching candidates for the priesthood, and talking to other people who teach them) that Pelagianism is raging among “orthodox” Catholics today. Pelagianism is the doctrine that we can save ourselves: if we just try harder, we can climb to heaven on our own strength. When was the last time you heard a homily about grace? This is raging, outrageous heresy, and it is extraordinarily dangerous to our spiritual life. It is a denial of Jesus, anti-Christ. To say “all for Mary” emphasizes not only who Jesus is, but what he does for us. Mary is, on the one hand, against the Protestants, all-holy, fabulously holy. Holiness is possible; mystical ascent into the life of the Trinity is the Gospel. But Mary is also, against the Pelagian Catholics, entirely dependent on Jesus. That’s why we look to Mary more than to all the other saints. It is only proximity to Jesus that makes us holy. It is always his work, not ours. To be “all for Mary” is to keep the truth of the Redemption always before our eyes. Finally, “for” is a word about motivation, and love. Far more than any of the other words for true devotion to Mary, “for” Mary indicates fire, drive, passion. “All for Mary” means every step of the way, we ask what we are living for. “All for Mary” means a real passion for evangelization. It means longing to see the image of Mary, radically holy because radically united to Jesus, repeated on every face we see. And thus being radically gentle. “All for Mary” means a real passion for the possibilities of man. It means remembering that every person we see has the possibility to be what Mary is. Mary didn’t have to convert: God signals to us that his action always comes first by being with her from the beginning. But conversion is possible. The greatest sinner is still made of the same stuff as Mary. He can become what she is. He too can be raised into the life of the Trinity. And so I must love him. Finally, “all for Mary” means a real passion for the work of God. It means repeating to ourselves, again and again and again, that Jesus saves, that grace is everything, that we totally depend on the mystery of the Incarnation. It means asking at every step, is the work of Jesus—what Jesus does for us—central to what I am doing now? This is the spiritual life. This is Christianity. How do you keep alive the fire for Jesus? Click here for more posts on Devotion to Mary. Click here for the entire series on Names for the Spiritual Life.